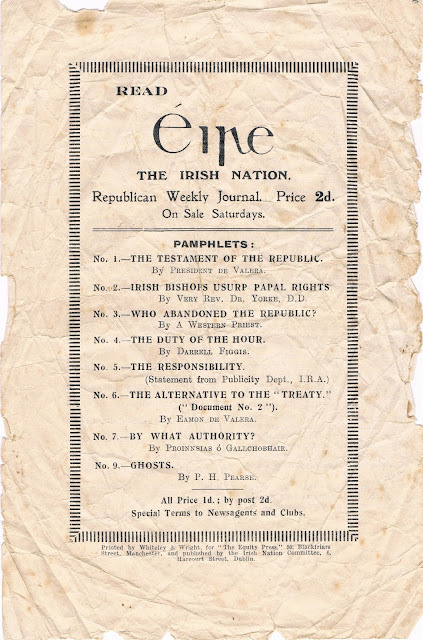 Today I'm posting the final part of the "Clause by Clause" pamphlet, written by Erskine Childers, from the Eileen Ryan Collection. Unusually in the document there is general agreement about finances in relation to debt and payment of war pensions. 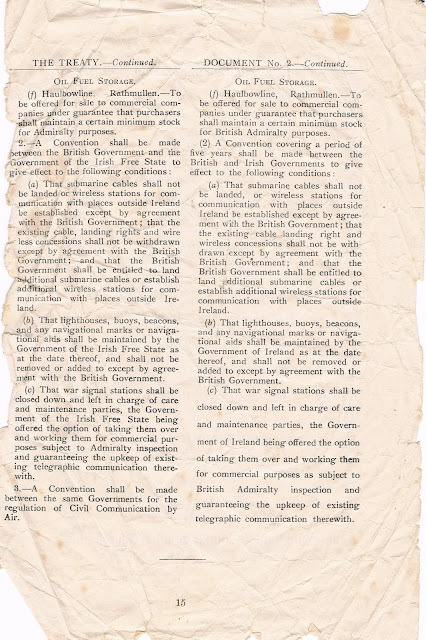 On page 14 reference is made in the Treaty to the infamous Boundary Commission (that did nothing) and Partition. Childers states that the Treaty delegation were "tricked" with the Boundary Commission promise of large areas to be "lopped off the Six Counties and returned to the Free State". This of course never happened. In Document No. 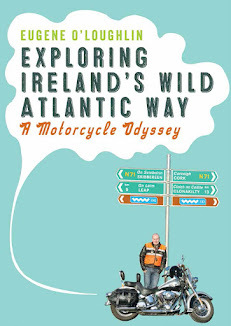 2, Childers regards relations between what he referred to as "North-East Ulster" and Ireland should be a domestic issue - with the North getting a "subordinate Parliament with local powers". This didn't happen either. The remainder of page 14 lists the naval bases to be retained by the British about which there is agreement between the two documents. While there is general agreement about matters such as "Oil Fuel Storage" on page 15 - Document No 2 prefers a five year period rather than the open ended terms in the Treaty. 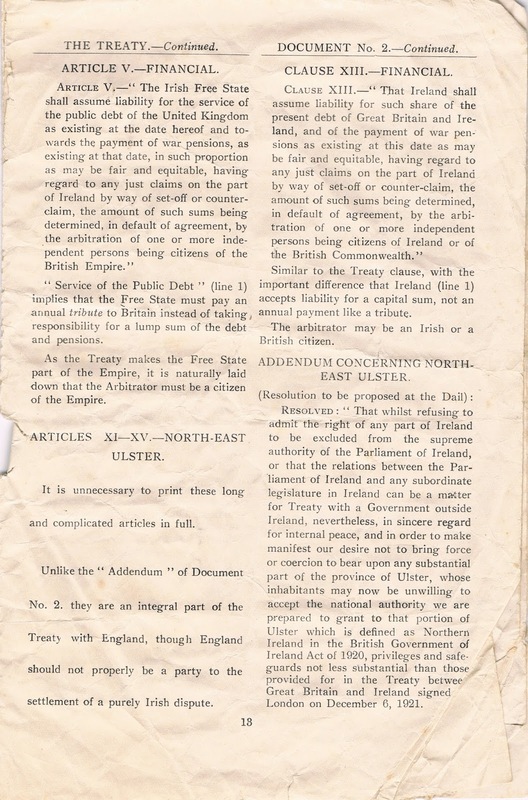 There is still a little bitchiness from Childers' use of words in referring to the "Government of Ireland" rather than the Treaty's "Government of the Irish Free State" - remember, the Treaty had not yet been ratified by the Dáil. 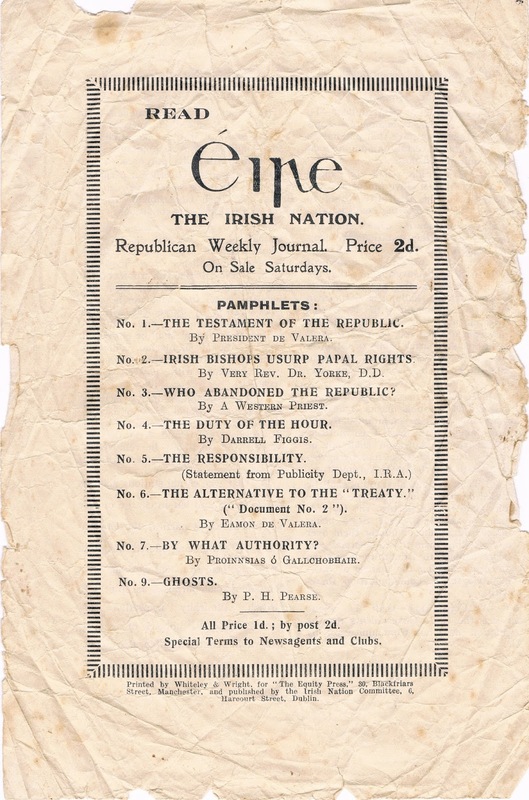 Finally - the last page is an ad for other pamphlets which included writings by Éamon de Valera and P.H. Pearse. They are numbered 1-7 and 9, the "Clause by Clause" document is numbered "8" on the front cover and is clearly part if this series. 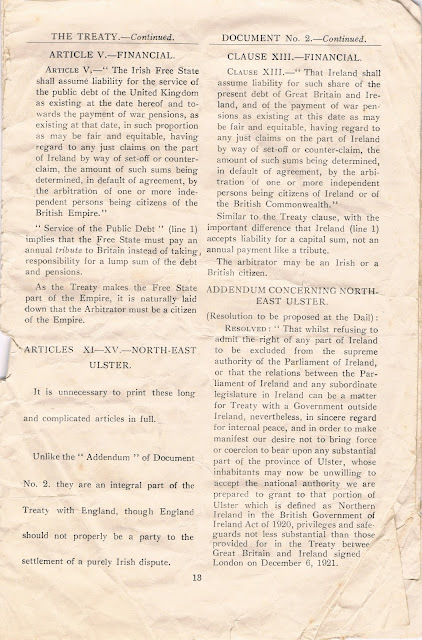 My final reflection on this document is that I think I would have firmly sided with Childers and de Valera in the Treaty debates. 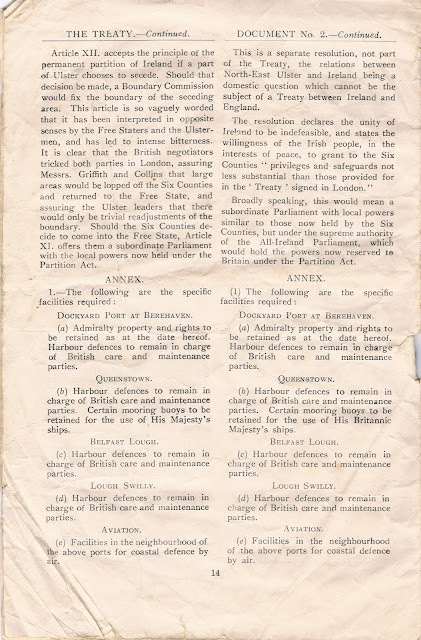 Even though the Treaty was passed by the Dáil and a referendum, I find it hard to believe that it was voted through when it contained the likes of the Oath of Allegiance. Erskine Childers paid for his republican stance by taking the anti-Treaty side when he was executed on 24th November 1922, aged just 52. His son, Erskine Hamilton Childers, became President of Ireland in 1973.